It can sometimes seem the bodybuilding world is obsessed with muscle pump - and for good reason. Nothing feels better than leaving the gym with swollen biceps and skin-splitting quads. So, it's no surprise serious weight lifters go to great lengths to seek the biggest pump. Unfortunately, supplement companies are well-aware of how much we all love a sick pump. This is why nearly all pre-workout supplements claim to enhance pump and vascularity - often without much evidence. The good news is that some PWOs do improve blood flow to the muscles. You just need to know which ingredients to look for on the label. "The greatest feeling you can get in the gym is the pump. Your muscles get a really tight feeling, like your skin is going to explode at any minute"
Without going into too much detail, the amount of nitric oxide in circulation determines the strength of a muscle pump. Nitric oxide dilates blood vessels and increases blood flow, which causes more to rush into your muscles during a set. A great pump isn't just for show though. Higher blood flow increases nutrients and oxygen available to a muscle, which can improve your performance and results. The extra muscle swelling also stretches the surrounding fascia which can lead to enhanced gains. In other words, a muscle pump lets you train harder and longer. Not bad for something that feels so satisfying! If you're looking for a pre-workout that can fuel stronger muscle pumps and increase your performance, you'll need more than a glorified high-caffeine drink (which is how we describe many lower quality stimulant pre workouts). We'll discuss ingredients for pump in a moment, but the most important is a high dose (at least 6000mg) of Citrulline Malate. This is a potent nitric oxide enhancer that can lead to huge pumps. 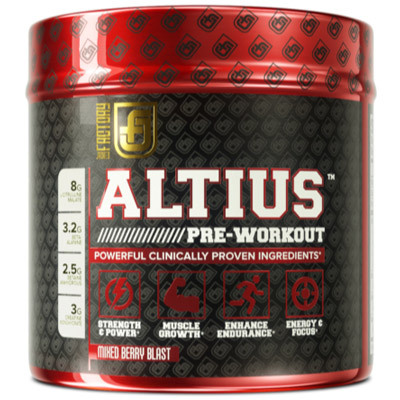 ALTIUS is a clinically-dosed pre-workout that has a huge 8000mg ofcCitrulline per serving. This is the largest amount of citrulline of any pre-workout we've reviewed so far (aside from Legion Pulse), which is why it can deliver sick pumps by boosting nitric oxide levels. It's not a one-trick pony though. Aside from citrulline, ALTIUS contains generous doses of beta-alanine, caffeine, betaine (which can also enhance pumps) and vitamin B12. It also has 3000mg of creatine monohydrate per serving, so it's effectively a 2-in-1 supplement. The result is an excellent PWO that can provide crazy vascularity, a powerful energy boost and enhanced performance. A bonus is that ALTIUS doesn't include any artificial sweeteners and has fully transparent doses. Also, while the ingredients list is shorter than others, it provides large doses of key ingredients - which is more important than a long label. The only real downside to ALTIUS is that it doesn't taste great. There's also no L-Theanine to balance the large dose of caffeine. 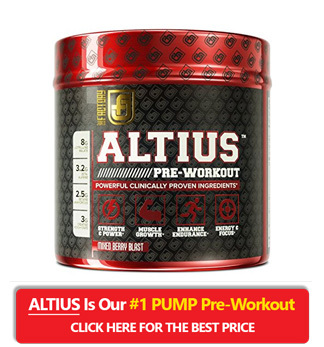 When it comes to enhancing pump and vascularity, however, ALTIUS is probably the best pre workout on the market. Summary: ALTIUS by Jacked Factory is one of our top recommendations for an all-round pre-workout (it came fourth on our list of the best PWOs). But when it comes to pump and vascularity, it's the best around - mainly due to the huge dose of citrulline. Read our full review here. The reason ALTIUS is such an effective pump pre-workout is that it contains ingredients that boost nitric oxide production at clinically-backed doses. This causes blood to rush into the muscles - especially if you take it around 30-45 minutes before a workout. ALTIUS isn't the only pre-workout that can boost nitric oxide production though. So, if you want to look for a different PWO, here are the ingredients to look for on the label. As we've already mentioned, citrulline malate (or L-Citrulline) is the king of pump supplements. It's highly effective at increase nitric oxide levels, which leads to increased blood flow and stronger muscle pumps. Fuller muscles isn't the only benefit of citrulline though. It can also improve endurance and reduce muscle soreness. What exactly is citrulline though? And why does it work? Before you can understand citrulline, you need to know about L-arginine. This was the "original" booster of nitric oxide production, as it directly increases nitric oxide production. Unfortunately, arginine isn't absorbed well in the intestines, so it's actually not that effective at boosting nitric oxide levels. This is why citrulline has taken over in pre-workout supplements. Citrulline is converted into arginine in the kidneys. Unlike arginine supplements, the body doesn't struggle to absorb it in large doses. This has the surprising effect of meaning that taking citrulline is actually more effective at increasing arginine levels than supplementing arginine directly. The dose is vital though. You should look for a pre-workout with at least 6000mg per serving. Red beet root extract is a lesser known pump enhancer. It works mainly because it contains large amounts of nitrates. Not surprisingly, these can raise nitric oxide levels in the blood. And, as you're now probably sick of hearing, nitric oxide dilates the blood vessels and increases blood flow. To be clear, beet root isn't as effective as citrulline, so it's not a replacement for the "king of pump supplements." But if you want an extra boost, along with a potential increase in athletic performance, it's an ingredient to consider. Betaine has been used as a pre-workout supplement for a while, but its full benefits are only starting to be understood. What's clear is that 1500-2500mg of betaine before a workout can have a number of positive effects, including increased strength and muscular endurance. Most importantly for this article, betaine has been shown to increase nitric oxide levels. The effect is more subtle than beet root or citrulline, but considering the other benefits of betaine it's an ingredient to look for in a pre-workout. Low-carb diets are all the rage these days - but they may not be helping your pump. Aside from dilated blood vessels, your muscles need full glycogen stores for maximum fullness. This is why many bodybuilders have a high-carb snack before a workout. It's also why people on a low-carb diet may not have the fullness their workout routine deserves. Reduce Rests Periods. When it comes to pure strength gains, a 3-5 minute rest between sets is often acceptable. This can kill your pump though, so aim to rest for no more than 60 seconds when aiming for maximum pump. Slow down your reps. Even experienced weight lifters sometimes go through the motions during a set. This doesn't just slow down your results, but can lead to a flatter pump. Instead, slow down your reps and focus on contracting throughout the range of motion. Superset to Muscle Fatigue. Supersets, where you complete two exercises without a rest, are a great way to fatigue muscles. This type of workout can quickly increase blood flow - especially if you work opposing muscles (i.e. mixing biceps and triceps exercises). Getting a great pump is one of the best feelings for any bodybuilder - and the right pre-workout supplement can make a big difference to your results. The key is to look for ingredients that boost nitric oxide production. Citrulline malate is the most important, but betaine, beet root and various others can have a similar effect. If you're chasing that skin-ripping muscle fullness, we think the best pre workout for pump is ALTIUS by Jacked Factory. It contains a huge amount of Citrulline for massive pumps - but can also help with strength, growth, endurance and focus. 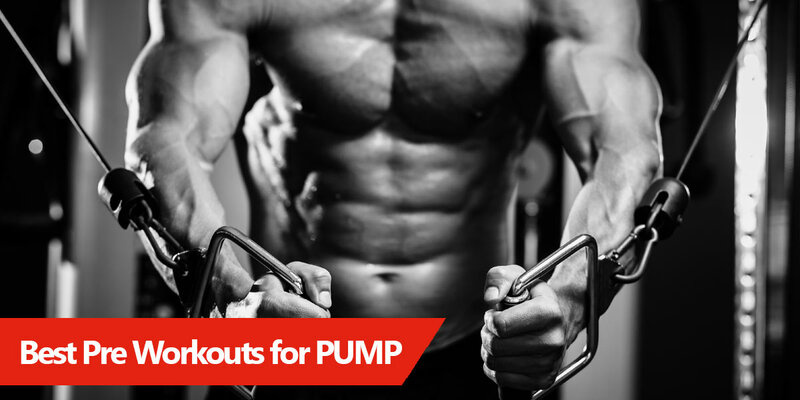 We hope this article has helped you choose the best pump pre-workout for your goals. If you have any questions, please use the comments form below.